To make a long history short, this first edition was sold recently to a record price of £275000,00 or US$416000,00, "the highest price recorded for a 20th-century first edition." Joyce's vast novel was met with bafflement and anger when it was first published in 1922 with one reviewer complaining that it "appears to have been written by a perverted lunatic who has made a speciality of the literature of the latrine". The more salacious bits are in the last episode, where Molly Bloom's long stream-of-consciousness soliloquy ends in her orgasmic "yes I said yes I will Yes". This first edition is unopened  apart from that last episode. The copy is number 45 of the first 100 and is printed on fine Dutch handmade paper. The dealer who made the sale, Pom Harrington, said the book was one of only four copies of that first edition print run, all signed by Joyce, which had been unaccounted for. 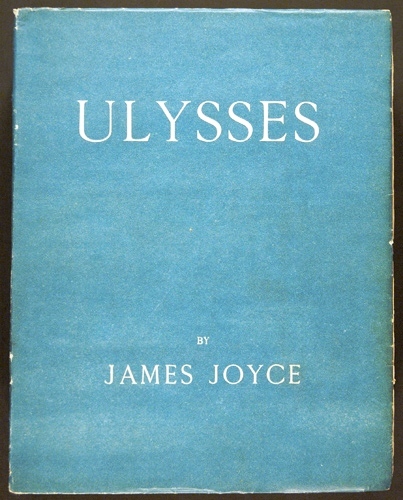 "In terms of collectability, Ulysses is considered to be the number one 20th-century book. This is such a find and it is in such fabulous, pristine condition." Las, but not least, ie effectively is one of the most sophisticated examples of the use of the printed word in its possibilitites.